As it happens, there are a great deal of good things to eat in Scotland, and growing up there I must admit I very rarely ate haggis, except on Burns Night, when you really must, for fear of offending someone, although Robert Burns himself I've heard, was a most understanding man.. I'm embarrassed to relate that my own sad attempts to cook haggis often ended in a burst haggis, floating sadly in the pot, looking like something akin to haggis soup, so it's not really as easy as it looks and should probably be left to the professionals. If you don't think about what haggis is made of, (and I don't make it!) it's rather tasty in fact, and is usually eaten with tatties (mashed potatoes) and as it can be a little dry, also with mashed turnips. I note happily that vegetarian haggis is now available, which will not only save the sheep, but also the tradition.. The other more traditional Scottish foods like shortbread and black pudding were only ever seen at Hogmanay at our house when I was small, but that doesn't mean they're not tasty..
..needless to say, not a dessert! Growing up near the raspberry fields of the Keillers' of Dundee, the same Keillers of the famous Dundee marmalade, we spent many summer days in the raspberry fields, picking the delicious fruit for fun and pocket money, often eating almost as many as we picked. The end product of all this picking, the raspberry jam, was so good, and full of flavour, I can recall it now.. The Scots do like fish and chips of course, which makes sense living near so many fishing boats, and the fish of choice was usually cod, or haddock, always served in newspaper, and often with a special treat, a small and extremely tasty pickled onion, which is optional! The other popular meal in Scotland is mince (browned mincemeat with onions and carrots) and tatties (mashed potatoes). For a working lunch, a Dundee pie was ideal, just buy it and eat it out of the bag fresh from the baker's shop. 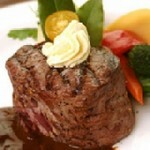 No elaborate preparation..nor a microwave oven needed..perfect! Forfar bridies are a relative of the Dundee pie and contain mutton and spices in such a combination as to render the flavour quite unique. Highly recommended! 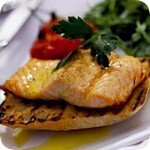 For more sophisticated palates, Scottish salmon, sometimes farmed and sometimes fresh from the streams is a favourite Scottish dish, and also its cousin, the trout. Cod and also haddock are popular, especially "smokies" (or wood-smoked haddock), and the Scots will often eat them for breakfast. I used to eat them for breakfast, and although cereal is probably more acceptable at this point, I can tell you they are very tasty. Now as mentioned before, black pudding is something that's quite popular, if not very photogenic...Here is some with baked beans. 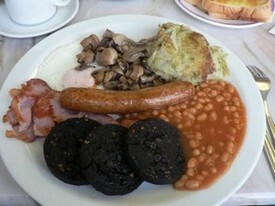 Actually this looks pretty good to me..
Black pudding served with beans, sausage, mushroom and bacon....yum..
A lot of recipes in Scotland seem to include whisky, although it is certainly not in everything! Here is some whisky marmalade, which may be an acquired taste..! Casual Scottish meals often involve "something" on toast, beans (of the baked variety) on toast, eggs on toast, toast and marmalade - naturally and chips, lots of chips. Now I'm aware that this is not traditional Scottish food, but the other delight to be experienced in my home town of Dundee at least, owing to the plentiful Indian restaurants is Indian food, namely curry..and immature as it may seem, we often had competitions to see who could eat the hottest curry without drinking any water..graduating from Madras to Vindaloo in short order..
Desserts are also many and varied, and in Scotland often involve custard. Another famous product is the Dundee cake, a delicious concoction made with fruit. 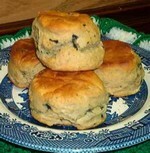 We are also very fond of scones in Scotland, because it gives us an excuse to eat the delicious raspberry jam with them. 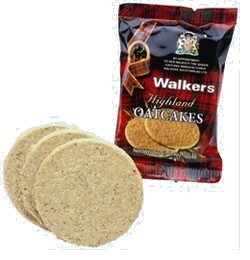 Creamy deserts are also very popular..
Now these round rather plain looking biscuit things are called oatcakes. They are, yes, made of oats, are rather dry, and are often eaten on Hogmanany, as they are traditional Scottish food. I know they are not particularly photogenic either, but they are good with cheese! With an international population in the bigger cities, it is hard to pin down exactly what "Scottish" food is, and although traditional food is still available, restaurants in these cosmopolitan areas will cater to almost any taste. In the smaller towns and villages the choice may not be so varied, but a fish and chip shop is never far away!